1938 Arkansas Inspection Sticker early 1st Year - $20.00 : Bob Hoyts Classic Inspection Stickers, Add a Final Touch to your Restoration! 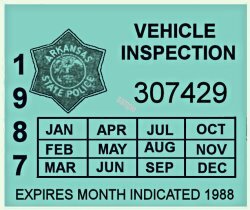 This 1938 Arkansas Inspection sticker was the first year Arkansas had an inspection program. This sticker was issued the first six months of the year. It expired at the end of the year. It has been digitally restored and reproduced identical in size and color both front and back to the original. It has been treated to prevent fading and has our patented "Peel and Stick" Format so it can adhere to the insde of your car windshield.